It was three-team race at the end of today's Penn Relays 4x1500 Championship of America relay, with Villanova relegated to the "show" position in third. Michigan, which held itself out of yesterday's DMR to focus on the remaining relays, took the victory in 17:15.47 (Penn Relays #6 all time), with Oregon coming second in 17:16.50 (Penn Relays #8 all time). Villanova's quartet -- with Angel Piccirillo, Nicky Akande, and Emily Lipari all doubling back from their respective 1200, 800, and 1600 meter relay legs yesterday -- came next in 17:17.57 (Penn Relays #9 all time), one second behind Oregon and two behind Michigan. Those three squads battled it out over the final laps, with fourth-place Penn State a full 45 seconds behind Villanova. Stephanie Schappert led off for Villanova and clocked 4:22.9, good for a very close third place at the first exchange. Nicky Akande was next for Villanova and ran a very crisp 4:18.0, putting Villanova and Michigan even at the second exchange with Oregon one second in arrears. 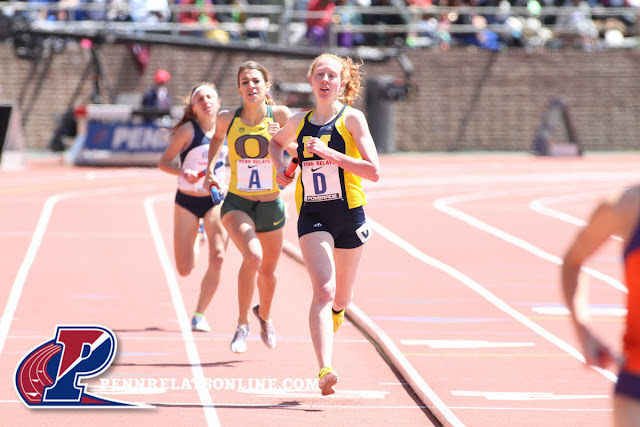 Angel Piccirillo ran well in the third leg, clocking 4:19.1, but Oregon's Anne Kesselring (4:14.3) and Michigan's Rebecca Addison (4:15.0) clocked the two fastest splits in the race on their third legs and put Villanova four seconds behind Michigan and 3 seconds behind Oregon at the final exchange. Emily Lipari fought hard to close the gap, running 4:17.5 (faster than both the Michigan (4:19.6) and Oregon (4:20.3) anchors), but had too much ground to make up.